Travel back to the Middle Ages and see what this exciting game was all about! A proud knight aboard his horse. Modern jousting can be seen at renaissance festivals and various reenactments. Two men on horseback challenge each other in this thrilling sport. In the 14th century, members of nobility took to the game to showcase courage, strength, and horsemanship skills. Nowadays, audiences from around the world enjoy watching performances. It’s a jump back in time! Played predominately by knights and lords, a joust was organized by men called heralds. There were teams of those challenging and those defending. In addition, each rider was given a rank, based on their abilities and victories. Depending on the challenge, large sums of money were placed as bets. Furthermore, marshals and constables would monitor the game to ensure the rules were followed. On horseback, the knights would charge toward each other with a lance (long weapon). Points were awarded based on hitting the right area, breaking a lance, or dismounting a rider. 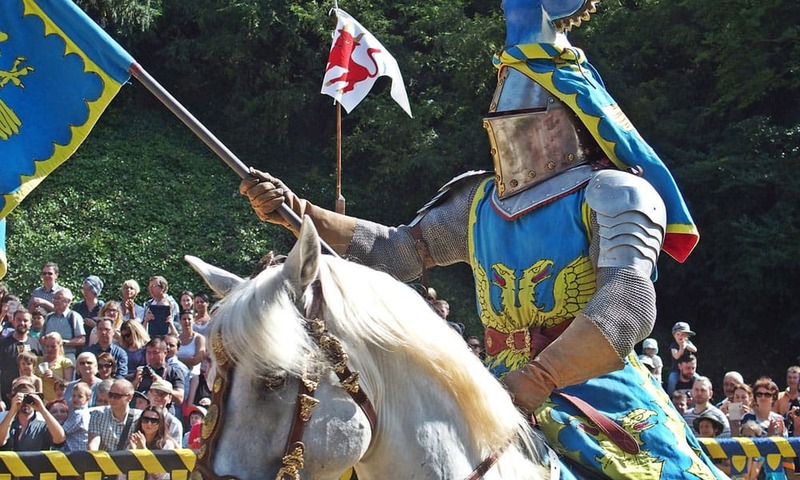 If you have interest in jousting, there are opportunities to try your hand at it. The Knights of Valour is a group that offers educational programs for students. Learn more below!